Dow Theory Investment: Dow Theory Update for January 24: Stocks close to signaling secondary reaction…. 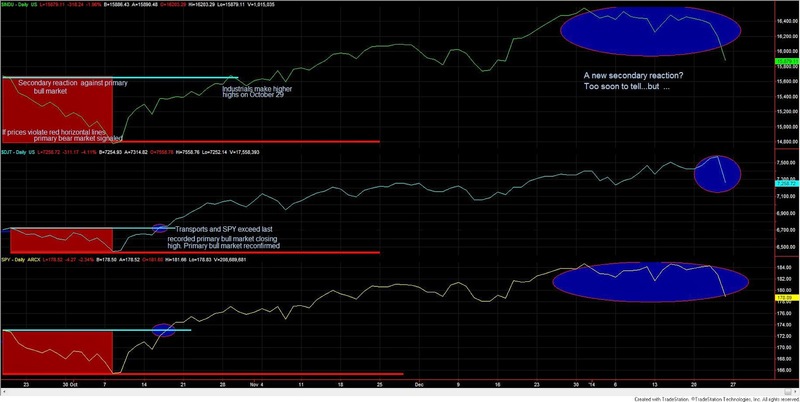 Dow Theory Update for January 24: Stocks close to signaling secondary reaction…. …But we are not there yet. Today, even though no trend was changed, was one of those days where it pays off to follow the markets. Thus, we saw stock indices collapse, whereas gold (GLD) managed to even post modest gains. By the same token, GDX managed to close with minimal losses. Maybe this time something is changing in the gold universe. If this is the case, there is no reason to hurry, and we patiently wait for the primary trend to turn bullish. Nonetheless, we are not there yet. Neither the classical Dow Theory, nor Schannep’s have signaled a secondary reaction. However, I am monitoring like a hawk the price action. As to the gold and silver miners ETFs, SIL and GDX closed down. GDX made a higher closing high unconfirmed by SIL. If this secondary trend is to last, SIL should confirm soon. In spite of today’s close, I still see uncommon strength in the gold and silver miners’ ETFs. This is why, last Friday January 17th, and in accordance with the Dow Theory, the secondary trend was labeled as bullish, as explained here.